Interior designer Kathryn M. Ireland has a devoted following and we count ourselves among her biggest fans. The designer, an Aga ambassador, has shopped with us for many years and we've collaborated on many projects, but getting to help with her brand new home in Santa Monica—and and then to see it in Elle Décor!—was an extra-special treat! (Click to see the digital story.) 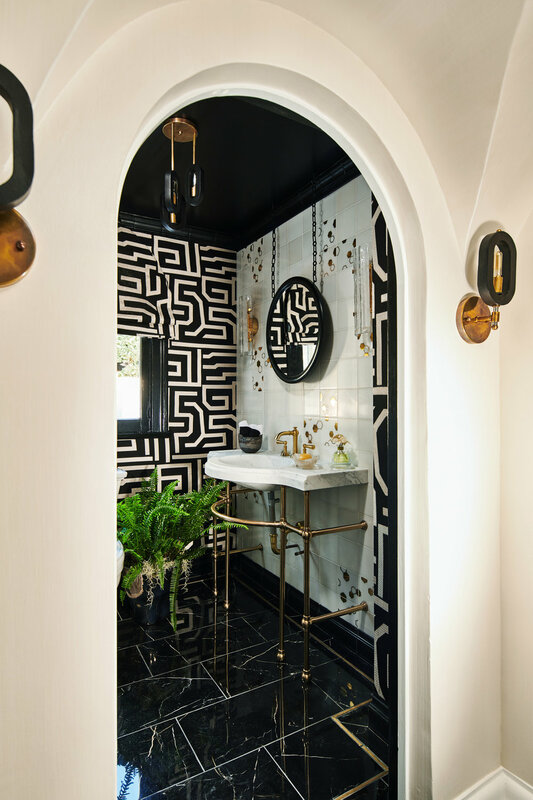 We're thrilled that the editors gave readers a peek into her powder room, below, where she combined a paisley wallpaper of her own design with an Arteriors mirror and our very own Kreoo sink and Fantini faucet. And did you know that Kathryn’s son Otis Weis has joined her firm and launched his own line of fabrics, Otis Textiles? The patterns and colorways bring loads of new options for contemporary window treatments and upholstery projects. It’s no wonder he’s already caught the eye of Luxe editors. You can buy the textiles direct online and even snaffle up a few pastel pillows from Consort before they sell out. Also, we can’t not share a few images from this year’s Pasadena Showcase House, where we were delighted to work with Louise O’Malley on her powder room, Greg Parker and Paul Heintz of Parker West Interiors on the master suite and Kirsten Acevedo of Borderless Design on the laundry room. Congratulations to everyone on a successful year!